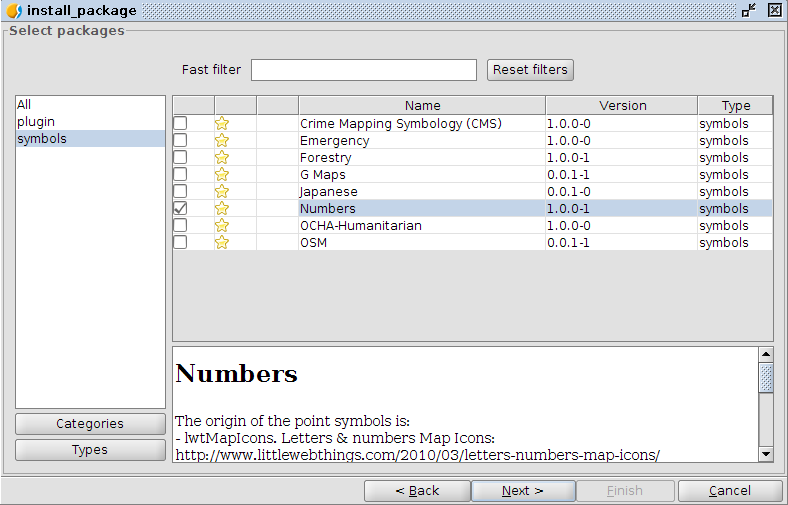 In more than a time we find ourselves with a need of a library with numerical symbols to identify specific elements in our layouts created with gvSIG. To solve it we generated a new symbols library, which we call “numbers” and that contains, basically, numerical symbols. To create the markers symbols we started from different sources on public domain. The symbols of “Letters & Numbers” published by Little Web Things that contains beyond symbols from number 0 to 99, letters symbols in upper-case of Latin alphabet. 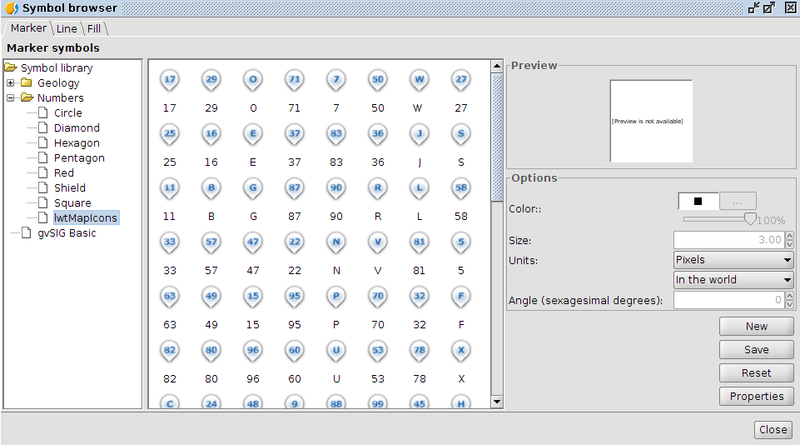 The fonts of text from Data Deja View (DDV) called “Circle, Diamond, Hexagon, Pentagon, Shield and Square”, that with Inkscape we transformed to svg files imported with gvSIG. The numbers icons belonging to the set called Red Orb Alphabet Icons of Icon Archive. Combining this markers we completed the library with symbols of lines and filling. Of course, when using point symbols of set “IwtMapIcons” consider that by default it don’t have applied a offset in “y”, if wanted the vignette appears over geometric point we have to edit the symbol properties and add an offset in “y” of a half the size ( in our case, as we set these symbols in size 32, we’ll use a offset of 16). Commenting too that one of the improvements planned to new versions consist in the symbols appears to us sorted alphabetically, what with no doubt will facilitate identifying them and, in cases like this library, will turn the time to search one of them smaller. The installation way is the usual, from add-ons manager (selecting URL http://downloads.gvsig.org/download/gvsig-desktop/ and searching for “Types/Symbols”) or directly downloading the package here.